Facebook has a new service, Facebook Questions. As the firms' Blake Ross explains, "Millions of people ask their friends questions on Facebook every day. What new music should I listen to? Where's the best sushi place in town? How do I learn to play the piano? How can I give my valuable time and knowledge to help an enormous, vaguely creepy corporation make money that it won't share with me?" I made that last question up. Maybe I should post it on Facebook. One question I don't need to ask is: what on Earth is Facebook up to now? It's obvious: it's another Facebook land grab, another attempt by everyone's favourite sinister social network to take something that exists on the open internet and bring it inside Facebook's reinforced walls. There are already stacks of Q&A sites online - Ask Metafilter, Yahoo Answers, Quora, Ask.com and many, many more - but none of those sites are Facebook. Time spent on those sites is time you're not spending on Facebook, and when that happens Facebook makes a sad face. By "sad face", of course, I mean "attempts to clone those sites in the hope it can do to their business what a Terminator would like to do to Sarah Connor". Like Google and Microsoft before it, Facebook's sheer scale means that when it decides to compete in a new sector, the resulting competition is a bit like a fist-fight between Soviet Russia and an eight-year-old girl. 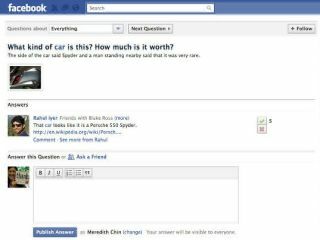 Facebook has half a billion users, and even if only the tiniest percentage of users contribute answers, and even if only the tiniest percentage of those users aren't complete and utter imbeciles - which, to be fair, is a pretty big if - then Facebook will end up with an enormous amount of Q&A content. Unlike the "demonic" content farms who are often pilloried for paying a pittance and stuffing the web with search engine bait, Facebook seems to think a pittance is far too generous. The answers won't cost Facebook a penny, but collectively they could bring in enormous amounts of traffic that Facebook can throw targeted ads at. It's a simple enough plan: make every single link on Google point to a Facebook page. Where's the best place to buy a T-31 Modulator? Ask Facebook. What's the best time of year to go turtle punching? Ask Facebook. How can I tell if I have a horrible bum disease? Ask Facebook. Have we always been at war with Eurasia? Ask Facebook. Matt Haughey created MetaFilter, one of the smartest websites on the entire internet. In a recent interview, he put it like this: "Facebook's coming at it from a corporate position. It's basically like AOL in 1997 - everything is there and there's no need to go anywhere else. I don't know if they're even considering what users want anymore. It's all about how to maximize revenue and all that crap." Still, it's not all bad. Dumbasses only have so much free time, so let's make sure we encourage them to spend all their time posting and answering on Facebook. By making Facebook into an idiot magnet, magically drawing all the droolers to its warm embrace, that'll keep the other Q&A sites idiot-free. Hurrah for Facebook!